Christmas Lights is a collection of four contemporary festive tales. Each one unique and totally fabulous reads. The Heart Of Joy by Vikki Kestral is a delightful tale that explores love and loss. Joy fears loving again as everything she loves, she loses. God does not wish us to live a life of fear. Fear is the opposite of faith. God wants us to trust Him and live again. The novella is beautifully written and it really spoke to my heart. I loved Blackie, a small dog. Vikki Kestral is a master story teller. She made me smile and she made me cry. A delightful tale. 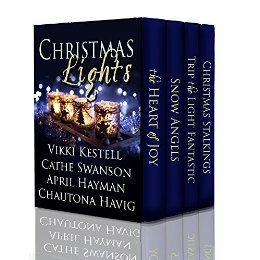 Snow Angels by Cathe Swanson is a story about compassion, healing and judgment. People can be quick to judge and label based solely on appearance. There is also a tendency to treat people differently based on the categories we have assigned them. The novella shows how some are totally filled with compassion for others. They are willing not only to give without expecting anything back, but they are prepared to walk the same road as others. People give even when they may have very little possessions which reminds the reader of the widows mitre. The homeless shelter in the story is a place filled with warmth and camaraderie. People are sometimes homeless through no fault of their own. There are war veterans in the shelter. It is sad to see that people who fought for their country can become invisible to others when the conflict is over. The subject of PTSD links in to this topic too. A wonderful tale set at Christmas that reveals the heart of God. Trip The Light Fantastic by April Hayman is an intricate tale where things are not always as they seem. Appearances can be deceptive. The reader is reminded that God looks at our inward appearance more than our outer one. The novella is about forgiveness and new beginnings. You are never too old to have a new start with God. There are some highly amusing moments. The lead character is not called Trip for nothing! There is also a pair of highly amusing elderly twins called Sissy and Sassy. Christmas Stalkings by Chautona Havig is such a delightful tale concerning a mystery and a household of many cats with the names of Santa’s reindeer. I had complete empathy with Wendy, the main character, as I, too am a crazy cat lady. I recognised a lot of my character traits in Wendy. Appearances can be deceptive. Too often we make snap judgments based solely on what we think we see in others. God always sees beyond the external and looks at the heart. There is the subject of grief in the story. Grief can be all consuming. Grief can bring regrets and guilt. Pets, particularly cats can be theraputic and help with the grieving process. Christmas Stalkings was a wonderful read that really ‘spoke’ to me. I adored Wendy and her cats. Christmas Lights is a wonderful collection of stories that are just perfect to read in the run up to the festive season. All were delightful reads but my favourite was Christmas Stalkings as I could associate with Wendy and her love of cats. This was a delightful review! Thank you! Do e-mail me and I’ll be sure to send you New Years Revolutions if you’d like. Thank you for your review of our stories. I’m glad you enjoyed reading them. Happy holidays! Thank you for such a thoughtful and engaging review. I’m thrilled that you enjoyed the books! Thank you for the kind words and for sharing our book. I am glad you enjoyed it! Great review! I really enjoyed this book also! I’ve read two of the stories in this collection and thoroughly enjoyed them. I’m looking forward to the others. Hot cocoa and fuzzy slippers required!